Buying a house is a big deal. Indeed, it is often seen as a milestone on the road to fiscal responsibility. Many of us grow up believing that homeownership is an essential step forward. There is still something satisfying about buying a house that you feel is your own. 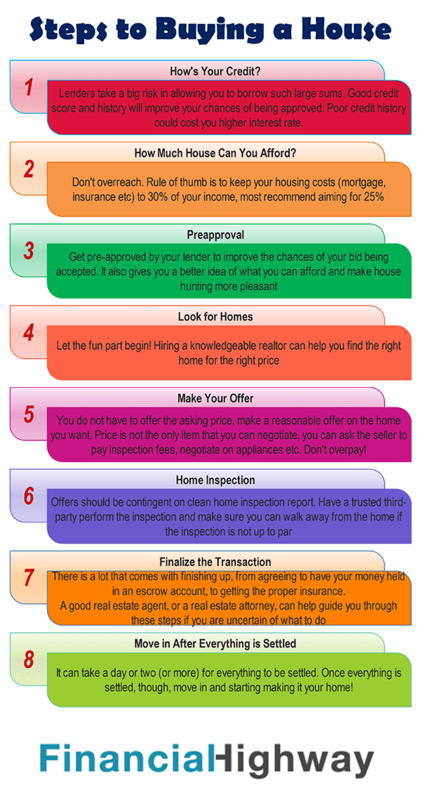 If you are interested in buying a house, though, there are a number of steps you need to follow. A home purchase is a major commitment. It’s not something to be taken lightly, especially since you will be asking a lender to allow you to borrow a large sum of money. You need your ducks in a row if you expect to successfully buy a home. Before you start house-hunting, you need to check your credit. Lenders are taking a tremendous risk in allowing you to borrow such a large sum of money. As a result, many of them want to ensure that you are likely to repay them in full, and make regular, on time payments. Your credit history provides insight into your financial habits and abilities. Before you are approved for a mortgage loan, your lender will check your credit and determine how reliable you are. If you have a positive credit history, you will be more likely to be approved for a loan. Those with poor credit may not even be allowed to buy a home. Even if you are approved with fair to poor credit, you will be required to pay a higher interest rate, costing you quite a bit more over the life of your loan. In Canada, you can check your credit report by visiting TransUnion Canada or Equifax Canada. It costs money to check your report online, but you can get a report free by snail mail. In the United States, you can get your credit report and monthly updates free through Credit Sesame, they also provide you personalized savings advice. If you find errors on your credit report, dispute them to have them corrected. If your credit report is negative, do what you can to pay down debt, and pay your bills on time, to improve your credit situation. It’s best to do what you can to improve your credit situation before you start looking for a home. 2. How Much House Can You Afford? Next, figure out how much you can afford. Look at your income and your potential payments. There are numerous mortgage calculators online that can help you estimate various payments. The main rule of thumb guiding how much house you can afford is the 30% rule. You are supposed to keep your monthly payments to no more than 30% of your income. However, that can still stretch your resources. Some recommend that keep housing costs to 25% of your net income each month. Be realistic, though. And remember that the costs of homeownership go beyond just mortgage payment and interest. There are also property taxes, utilities, maintenance, and repair costs. Once you have an idea of what you can comfortably afford, it’s time to take the next step. You might also be asked for other documentation, or to fill out forms. Call ahead, and find out what you need. A preapproval is the only way to seriously find out exactly what the bank is willing to lend you. A prequalification is not the same thing. If you want to be able to make a serious offer on any house you are interested in, you need preapproval. Having a preapproval lets you know exactly how much you can borrow. This is a good time to figure out which type of loan you want, and agree to terms. Later, as you go through the home buying and mortgage process, you will be required to provide more documentation and information. Make sure you know ahead of time what you need. Now it’s time to look for homes. Once you know how much you feel comfortable paying, and what you are preapproved for, it’s time to house hunt. Determine which criteria are most important to you. While you may need to compromise on the less important features of a home, you will want to make sure that the most important aspects of your home are part of the process. Stick to your criteria, especially price, as you look for a house. If you want help with the home buying transaction, you can get a real estate agent to help you look. A good real estate agent will help you find the home you want. Look for someone who is familiar with the area and the local market. Also, look for someone who is a buyer’s agent, and has your best interests at heart. In many cases, a good buyer’s agent is someone you won’t even need to pay to help you find a home; the seller usually pays the fee. When you find a home that you like, make an offer. You don’t need to offer the full amount that the seller is asking. You can make a lower offer, to see if it is accepted. It’s also possible to negotiate on other items. You can ask for a carpet and paint allowance if there are cosmetic issues with the house. You can ask the seller to pay some costs, such as the home inspection cost, or the closing costs. There are a number of ways to negotiate, and it doesn’t have to be just about the asking price. Be careful of getting in a bidding war, however. Unless the house really something else, there is usually no good reason to start competing for the privilege of paying even more. A bidding war can result in you spending more than you would like on the home, and even, perhaps overpaying. Sometimes, you might be asked to put down earnest money to ensure that you are serious. Before you do so, find out if you can get the money back if your bid is rejected, or if someone else’s bid is accepted instead. You want to be careful about how you approach negotiations, and be very careful of what you sign. A knowledgeable real estate agent can help you navigate these waters, and get closer to what you are looking for, without being taken advantage of. Before you finalize the transaction, you need to have a home inspection completed. Any papers that you sign regarding your intent to purchase a home should clearly state that your compliance is based on the outcome of the home inspection. You need to make sure you can walk away from the deal — with your earnest money — if the home inspection isn’t up to par. You can also make your agreement contingent on the seller bearing the cost to bring the home up to scratch. Have a home inspection performed by a trusted third party. You should also double check other items before you finalize. Find out about any environmental issues nearby, and special permits that you might need to build on your property. Look for restrictions on usage, and double check to ensure that you are in a neighborhood that you like, with the amenities you want close by. You can also double check which schools your children will be attending. Verify that everything is as it should be before you complete your commitment. If everything appears to be in order, it’s time to finalize the transaction. There is a lot that comes with finishing up, from agreeing to have your money held in an escrow account, to getting the proper insurance. You will also need to complete the paperwork for the title/deed, as well as ensure that you have made all the other necessary and legal arrangements to buy your home. A good real estate agent, or a real estate attorney, can help guide you through these steps if you are uncertain of what to do. It can take a day or two (or more) for everything to be settled. After all, this is a big transaction! Once everything is settled, though, you have the legal right to take possession of the home. Move in, and start decorating. And make sure that you keep all of your documents in a safe place, where they won’t be ruined by fire, or natural disaster. Wouldn’t you say it’s also a good idea to have a final inspection just before closing on the property? It takes months from the beginning offer and inspection of the house until you actually get to close. A lot can happen in that time frame. I’d be sure to have a final inspection before signing that final document. That’s a good point Bo, if the closing takes a while you should get an inspection done just before finalizing things. You definitely need to take into consideration home improvement costs, moving costs, and closing costs. They can add up in the end. My major error in getting a pre-approved mortgage was to deal only with the bank that I had been with for over 20 years. I did not know what mortgage brokers did or were, and should have gone first to one of them. They are free and get their fees from the bank that you eventually choose for the mortgage. Because I was identifiable with my bank and not just a qualified applicant, my bank decided I was too old for a mortgage. Yes it happens. Of course the bank did not say so but after pre-approval at the local branch, our file was sent to Head Office, and delay followed delay with greater requirements, until my option to purchase was in jeapordy. Then I had to scramble. I later discovered that a mortgage broker will get you a better deal than your trustworthy bank with whom you’ve built trust. I live in Canada so maybe mortgage brokers operate differently in the US. This is hard learned advice. Having good credit is an essential foundation when looking to buy a house. It makes the whole process easier which is critical for such a complicated matter.